Joseph Pratt Lawton was born May 22, 1833 near Antwerp in Jefferson County New York. When he was twenty three years of age, on the 29th day of October 1956 he married miss Jane Wilson on her 21st birthday. During the following 22 years eleven children were born unto them, all near, or in, Philadelphia, New York, just down the road from Antwerp. Of that total nine of them reached adulthood including my grandfather Will, born April 25, 1866 (as was his twin sister Wealtha), and their younger brother Charles born November 30, 1875. About the time the dates changed from the 1800s to the 1900s Charles wed Mary Noody. On May the seventh 1904 Charles and Mary, having had children in 1901, 1902, 1903, now had their fourth which they named Ralph Gerald Lawton. Grandpa Will and Jane had their first mutual child August 27, 1905. This child was named Lloyd, and he ultimately became my father. Thus my father and Ralph were first cousins, their fathers being brothers. I shall gloss over the next twenty years or so bringing us to June 1925. It was on the 20th of that month that my father married Alice Halladay ultimately bringing about my birth some 13 years later. About a month after their marriage, July 17th Ralph married Grace Halladay, sister to my mother. They had three children, Harold in 1926, Ralph Jr. (Gene) in 1927, and Richard (Skip) in 1929. Four months after Skip’s birth Ralph Sr. was killed in a farming accident just short of his 25th birthday. Some ten years or more ago, I was wandering through a cemetery in search of a family member, when what should I discover but the tombstone marking Ralph’s resting place for the previous seventy-five years or so. At the time I was a bit surprised as I had no idea he was buried there. A couple of years then passed until there came a day when Gene and I were conversing. He mentioned he had no idea where his father was buried, and I told him I did know. He then asked if I would tell him how to go there, and I answered that I would take him there. At that point we went together directly to his father Ralph’s grave, paid our individual respects, and left again. Bringing this tale up to the present I no longer know where this tombstone is located. In recent years I have taken it upon myself to photograph all those family stones that I can locate. Upon returning to photograph Ralph’s tombstone, I cannot locate it. According to two records that I am aware of including the cemetery records for the Grove Cemetery in La Fargeville, Jefferson County, New York, it is supposed to be in that cemetery, but those records do not say where. I have searched for it several times with no success. Graveside services for Lawrence B. Lawton, age 81 of Cemetery Road will be held privately for his family at the Flackville Cemetery. 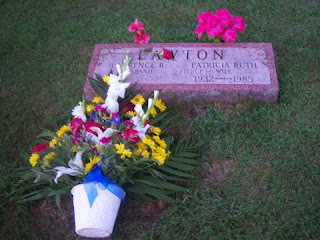 Mr. Lawton died Saturday (July 23, 2011) at his home. Arrangements are with the Fox & Murray Funeral Home. Surviving are his children, Paula Hillis and husband Alex of Cambridge, Bern Lawton, Timothy Lawton and wife Marion of Ogdensburg, Susan Shannon and husband Mitchell of Ogdensburg and Sandy Gauthier of Phoenix, AZ; brother Leo Lawton and wife Nora of Ogdensburg; sisters Rosalee Bloss and husband Chuck of Lakeport, Janice Norton and husband Mills of Canton, and Lori Rienhardt and husband Richard of Otisco; grandchildren Betsy Brander and husband Chad Underwood, Alexander Hillis III, Lawrence Hillis, Joshua Hillis, Carrie Lawton and companion Joe Moore, Cindy Lawton and companion Nigel Austin, Brian Lawton, Patrick Lawton, Benjamin Lawton and fiancé’s Wendy Chapin, Jonathan Morley and companion Jeanette DeLorme, Emily Morley and companion William Moeglein, Alicen Morley and companion Kristopher Lee, Elena Gauthier, and Andre Gauthier; and several great-grandchildren and many nieces and nephews. He was predeceased by the love of his life Patricia Pierce; and eight siblings, Lloyd “Bert”, Robert, Ronald, Delbert, Alford ‘Fred”, Jon, Dixie and Mary Lawton. Larry was born on September 21, 1929 in Stone Mills, a son of the late Lloyd & Alice (Halladay) Lawton. He graduated from the George Hall Trade School and was enlisted in the US Navy from 1948-1955. He married Patricia R. Pierce on December 2, 1950, and worked briefly for Tenant Electric in Potsdam before operating a dairy farm in 1957. He is best known for starting and operating the family business Lawton Electric with sons Bern and Tim. One of his fondest memories is of driving the Euclids or “Eucs” during the development of the St. Lawrence Seaway. He enjoyed reading, writing poetry, hunting, fishing, driving tractors, and most of all spending time with his family. Let’s stop right there for a moment and determine what that means. Isn’t it pretty plain that our founding fathers thought that everybody was an equal person. Okay then, and I mean by this in economic way, when did it become fashionable to decide that some people were more equal than others? A monetery system has one real purpose, and that is to equalize labor factors. It is difficult to determine equal value for a manufactured product without some sort of economic system. Should a shoemaker trade a pair of shoes for a pair of potatoes? How many gallons of milk should a dairy farmer trade for a pair of overalls? This is where an economic system enters the picture. A money value is established for a product, usually based on the amount of labor involved in producing the product. This establishes how many widgets should equal one gadget, or how many gadgets should equal a certain number of what-cha-ma-call-its. If all men are created equal, then should not their labor also be equal? Whether valued in rupees, yen, or dollars, should not one human’s hour be of equal value to another person’s? Of course it should. How then did a professional athlete’s hour become valued at a million dollars while a dairy farmer’s is only valued at ten dollars? Why is a doctor’s hour considered more valuable than his patient’s? When we are born we know not how many hours we have on this earth, but why are whatever their number not all equal to our fellow time travelers? October 29, 2004 Osama Bin Laden in a released speech aired on al-Jazeera, the Qatar based satellite television network, stated his goal was to bankrupt the United States of America. He further stated at the time that the United Soviet Socialist Republic (USSR) had been defeated in Afghanistan twenty years previously in the same manner. One must really think hard about that statement. Even though he is a dead man, did he nearly, if not actually, bring down the most powerful nation on earth with his strategy? How could one man dedicated to a purpose almost bring the United States to the brink of bankruptcy? Or should the question be, how can the United States Government allow itself to be in such a terrible financial position as it is presently in? How on earth did Georgie Junior take us into Iraq to squander trillions of dollars? What is wrong with our system that this could happen? What have we been doing in Afghanistan for all of these years, omitting from your answers, of course, besides spending more trillions of dollars? Lloyd Benjamin Lawton was born August 27, 1905. Alice Pearl Halladay was born May 1, 1906. They became a twosome when they married June 20, 1925. July 13, 1927 their first child, a son, Lloyd Burton Lawton was born, and now there were three. Two years later, Lawrence Bernard Lawton was born on September 21, 1929. The fourth member of the small family apparently came in with a crash, as that’s what the stock market did about a month later. A small detail like a stock market crash beginning the great depression didn’t stop Mary Louise from being born November 21, 1931, and so it was that a girl child made family member number five. Next came four boys in a row to this ever increasing family, Robert Allen July 5, 1933, Ronald William December 6, 1934, Delbert Arthur November 12, 1936, and Leo David July 19, 1938 to make a total of nine. Dixie Rose was then born on February 25, 1940 increasing the family size to ten, but she died young January 2, 1942, and the number reduced again to nine. Four months later, May 3, 1942 Alford Leslie was born, and the family became ten again. August 17, 1944 Jon Edwin was born, the eighth and last son, becoming number eleven in the family at the time. Then three girls were born in a row, Rosalee Anne May 23, 1946, Janice Elaine November 3, 1947, and Lorabelle Alice July 25, 1951. If you’re trying to keep track there were now thirteen children born, eight boys and five girls, of which one girl had died leaving twelve living children, and fourteen members of the family. October 27, 1974 Dell died. February 26, 1975 our father died. May 26, 1984 Ron died. May 4 1988 mother died. June 11, 1994 Bert died. September 14, 1995 Bob died. December 20, 1996 Jon died. April 16, 2002 Fred died. July 23, 2011 Larry died. And now there are four remaining, and the family diminishes, but there are hundreds of descendants to keep the name intact. We were fortunate, as well as prolific. Did you ever know that it was possible to have five (or more) valid New York State driver’s licenses at the same time? Here’s what happened. About a month prior to my birthday this year I got a notification from the New York Department of Motor Vehicles (DMV) stating that my driver’s license would expire on my birthday. No problem! I went to the DMV Department in my local county building. I was given a rudimentary eye test, apparently passed it, and was told to go to another line where I was issued a temporary license to expire in 90 days, and told I would receive a new license in a week to ten days, after forking over $72.50. As my license that I’ve had for the past 8 years was still valid I now had two valid licenses. Sure enough, a few days later I received, via U S Mail, a new New York State driver’s license. That made three valid licenses I now had in my possession. Things went along fine for a few days until I lost my wallet. However I know where my lost wallet is. It is baled up in a large round bale of hay. I should cut the bale open and retrieve it, right? The only problem with that solution is I don’t know which of 32 bales it is in. So, I returned to my local county building again. I told the sweet young thing at the license counter that the morning before I had a valid license, but by night I no longer had one. After she thought about that for a minute or so she said, “What?” I then told her I had lost my wallet the previous day including my newly issued New York State driver’s license. She gave me a form to fill out, which was not too difficult, and then I returned it to her. She looked it over, presumably to make sure I was not a foreign agent of some sort, approved it, and once again sent me to the line to pay for my mistake. She said, “Oh, this machine will print you a temporary 90-day one in a moment.” She was correct, the machine began to rattle away, and she handed me a new temporary license with the statement that I would receive a new valid license within a week or ten days. Although I could not actually put my hands on one of them, I now had four valid NYS driver’s licenses. A few days later, just as the lady said it would, I received yet another valid NYS driver’s license in the good old U S Mail. This made me yet a fifth valid license. As today is my birthday, meaning the one I’ve had for eight years is still valid, I right now possess five valid NYS driver’s license, albeit one of them is a little hard to present to a law officer if the need should arise. Pick a bale, any bale, it might be in there. How many legs do you have on your stool, and why? For this discussion it is taken for granted that in all cases outside factors remain equal. If a 150 pound man had a one legged stool with a bottom area of one square inch then the resultant pressure on the floor while the man sat on it, would be 150 pounds per square inch (PSI). If this same man obtained a two-legged stool with each leg having a one square inch floor surface it would cut the floor pressure in half, or to 75 PSI. Going one step further if our 150 pound man went to a three-legged stool the pressure would drop to 50 PSI. Obviously the more legs on the stool the lesser amount of floor pressure there would be at the point where the legs made contact. Hold on, not so fast, it ain’t necessarily so. When you go to a fourth leg it becomes theoretically impossible to make all four legs hit the floor with identical pressures, as can be done with the three former types. Therefore it becomes impossible to lower the floor pressure to 37.5 PSI. Theory states that the four legged stool will sit on two opposed legs equally, but will rock back and forth on the other two, effectively placing all of the weight and consequent pressure on two legs much of the time, placing a higher pressure on the floor than in the case of the three legged stool. Who cares? Anyone with floors in their home wishing to keep them from excessive wear due to kitchen stools. Vinyl flooring is especially susceptible to this form of torture. Do you want to think further along this line? Okay, how about this one. Our 150 pound man has a wife who weighs exactly 100 pounds. Lots of the time she wanders aimlessly in the kitchen with slippers on, barefoot, or wearing some sort of sensible shoes. In the process of walking her weight is constantly shifting from one foot to the other, but much of the time only on one foot at a time. Thus her 100 pounds can be divided by the square inches of shoe surface dwindling the floor pressure to a minimal number. However, from time to time she dons spike heels while preparing to go out for an evening of dining and dancing with her husband. As she walks through the kitchen, on her way to the attached garage, that 100 pounds of weight applying pressure to a ¼” square area, exerts 1600 PSI on the floor. Spike heels are death to a vinyl floor, and the husband’s foot also, if he mentions her weight appears to be above that 100 pounds. For those few individuals living in caves in the Himalayas, Casey Anthony was accused by the State of Florida of the murder, in the first degree, of her two-year-old daughter. July 11, 2011 I read in an article on ABC News a video recording taken at the moment Casey Anthony was notified her daughter’s body had been located may be allowed to be seen by the public, although it was not allowed by the State of Florida to be used as evidence in the trial. I ask the question, is this judge daft? I see nowhere in that sixth amendment where it says a judge has any right to determine what the jury may see, or not. What is meant by “highly inflamatory”? Is it more inflamatory to show a video of the accused’s reaction to the knowledge her victim’s remains have been found than it is to accuse her of murder of that same individual? It seems to this poor layman that this Florida judge took it upon himself to overrule the Constitution of the United States. Should this not mean the State of Florida Attorney General could not ask for a mistrial, and this entire charade of a trial could be tried again? A stroke, by definition, is the sudden death of brain cells in a localized area due to inadequate blood flow. My father, born in 1905, was in his upper sixties when, after having heart problems for years, had the misfortune of suffering a stroke. It has been said by those much wiser than me, that there is a silver lining in every cloud. If there was a good part of this incident it was that the resultant damage was not anywhere near as devastating as it could have been. Father was able to continue with life with only a minimum of side effects, but one of them he considered humorous. I, having no idea what he was getting at, answered, “I suppose to pay for items you might care to buy”, or words to that effect. Again, I had no idea, and said as much. Father then explained that since he had his stroke he could inexplicably not count change any more. Paper money was no different than it had always been, but change was a horse of a different color. He went on to tell me that for instance an item might come to a total of $49.67. He could open his wallet as he always had and count out two twenties, a five and four ones with no hesitation, but the change he had no idea how or what to give. He then would reach in his front pocket and remove a handful of change, and tell the bewildered store clerk to take whatever he/she might want. He told me that rarely did they do it without hesitation, and this he found humorous. He guessed that most clerks thought it to be some sort of joke, or scam. Finally, at my father’s insistence, they would hesitantly remove a quarter from his hand and lay it on the counter. Then they would ever so carefully remove a second quarter and lay it along side the first one, after stating they were taking a second quarter. Then it was continued with the dime, nickel, and pennies until the required amount lay on the counter. Only then would the clerk pick up the change and place it in the register with the paper money. My father told me the humorous part was that they could have taken every one of the coins one at a time and placed them on the counter, and he would not have suspicioned it was not the correct thing to do, but he was assured in his own mind that he had never been cheated in any manner. Give or take a few, it was about twenty five years ago. A good friend, named Lawrence, was taking his son to Boy Scout camp for a couple of weeks stay. After talking it over we decided it would be a nice motorcycle ride, his son would love it, and with both of us involved we’d have enough room on the bikes for gear for a two week stay for the boy. I mentioned our little daytrip to my son Carl, and he decided to ride along with us on his bike too. The seventy mile ride to camp was uneventful other than it was a super beautiful sunshiny day, and we truly enjoyed our Sunday trip. After settling in the boy, and making sure all was as nice as we could make it for him, the three of us began our return trip. By now it was getting into late afternoon, but the weather remained beautiful and the ride was really great. All went well for about the first forty miles or so, but the sky ahead was beginning to appear a bit ominous as it darkened too early for it to be evening already. At the time I was leading the other two as we went through the small village of Dekalb, in St. Lawrence County, New York. As we left the north end of the village, which is no more than a dozen homes, there was a sharp right hand bend. The speed limit is yet only thirty miles per hour, but I probably was exceeding that, as I sometimes did in those days of yore. As I rounded the bend leaving the village I abruptly twisted the throttle on the bike to increase my speed to at least the 55 mph rural road speed limit. I didn’t notice the wet pavement until it was too late, but as sure as rain will always fall, it had that afternoon at that place. As I hit the throttle, I also hit the wet road, and immediately I lost traction as my rear wheel spun. As I was in the middle of the right hand bend, the rear of the bike went to the left. I managed to get it back upright again, but only for a limited amount of time, before it went the opposite way in an over correction. That time I knew I was going to lose it, so I stuck my left leg down in a foolish attempt to keep the bike tire side down. About that time the foot peg hit me in the back of my left ankle. This caused my left foot to be driven into the pavement as the bike passed over my left foot. The bike, and myself, went down in an ignominious heap as we slid across the wet pavement together. This was not the way I had planned to exit Dekalb, but that was the way it was. I was directly in front of a home from which a nice lady suddenly erupted. She mentioned that she was a registered nurse, and did I need aid. Not wanting to get the law involved in my foolishness, I insisted I was fine, but let me assure you my left foot hurt something awful. The bike never quit running so I got it back up on two wheels again with the help of my riding partners. I straddled that thing again, and reached down with my left foot to shift it from neutral to first gear. Mama mia let me absolutely assure you that was the moment I decided I had broken the big toe on that foot. The big toe is what is used to shift with. Tears came to my eyes as I managed to catch the shift lever with the edge of the sole of my boot, and pull it into gear. Twice more I accomplished this little trick, but to try to go into fourth and fifth gears was asking too much. I rode the final thirty miles home in third gear managing somehow never having to stop or shift again. I managed to hobble enough to continue working, but it was quite a while before it became possible to walk sort of normal again. The toe ultimately healed, but it is sort of misshapen yet today. It is my studied opinion that if you go back far enough to find the connection, all people on earth are related. Such is the case with the good folks in this little tale. I would need to go back many generations to find my relationship to this family, but cousins they are. Ray Lawton was born in 1884, son of James Lawton and his wife, the former Sarah Saubert, all in the great state of Wisconsin. Ray’s mother, Sarah, had a brother Mike Saubert living in close proximity to the Lawton family. Mike had a couple of sons named Bill and Al Saubert, who, of course, were first cousins to Ray. It seems on a few isolated occasions around the turn of the twentieth century the cousins, as well as a couple of friends named Carl Smith and Bill Burgduff, had pilfered a few chickens from their neighbors and cousins the Taylor family. Enjoying a good joke, they had a chicken roast with the results of their ill-gotten gains. The Taylors, missing four or five chickens every once in a while, placed a lock on their chicken house to preclude fowl theft. That presented the boys with a double joke opportunity. James Lawton told the boys to take some of his chickens any time they wanted a chicken roast, but that was no fun at all if he didn’t mind, so they hatched a new plan to lift Taylor’s chickens. One dark moonless night they crept up to the back of the chicken house carrying a long sturdy pole. They inserted the pole under a back corner of the chicken coop and pried the entire building up high enough for the smallest boy to crawl under. With no chicken getting a chance to make a sound, swiftly a supply was passed to the boys on the outside before Al crawled out underneath again. The coop was then allowed back down onto its wall, as the boys hurried away in the darkness to a fine chicken roast. The Taylors missed their chickens, but never learned how they had disappeared. The culprits told the story, and enjoyed a good laugh in the telling, for many years thereafter.